This is Second Edition! Thirty five percent more pages than the first edition. This book explains the process for making common lay three or four strand twist rope with a hand operated rope machine. Different style rope machines are described, along with the rope tool, and traveler hook needed to make a working set up for making a rope. Separate chapters are now devoted to the rope tool, and traveler options. Other chapters focus on design considerations for the rope and how to form it. New material has been added to the chapter detailing how to lay up the yarn (string, twine, etc.) to form the strands of the rope. The lay up process has been extended to detail how to incorporate a ring or link into the end of the rope during the lay up process. This book identifies the rest of the parts needed in conjunction with the	rope machine for making rope. Many parts you already may have. It all depends on the rope length and diameter you are interested in making. Scale your operation up or down as desired. Whether using thread to make scale cordage for model boats, or heavy yarns to make inch thick rope, this book describes the process to make the rope. Before the early 1800's, all rope was made per the methods shown in this book. Rope making gave way to machinery as the Industrial Revolution developed. The farmers in the American Midwest used these machines to make replacement rope for their barn's hay hoist. The farmer and his family could use a rope machine to convert available binder twine and make a new 140 foot, or longer, inch diameter rope in less time than one might ride horseback to town to acquire a replacement rope. 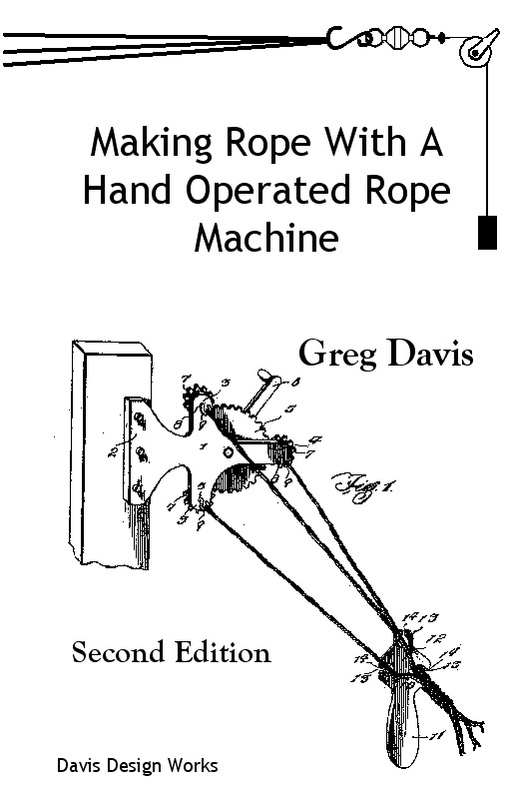 Title: Making Rope with a Hand Operated Rope Machine, Second Edition, by Greg Davis, now 107 pages in 8.5 by 5.5 inch format, 59 figures, 5 tables. Softbound. Sample the book - Chapter 1 an overview of making rope. Got questions or want to buy direct, See Parts Ordering Page for ordering information. Online and credit card orders for this book and M2K rope machine kit can be made through www.lehmans.com, Search for "rope book or machine" on their site. Phone 1-877-438-5346.